After a sensational opening season at the Royal Shakespeare Company’s Swan Theatre in 2016, Angus Jackson’s joyous production of Don Quixote transfers to the West End, with David Threlfall and Rufus Hound reprising their original roles. Poet and journalist James Fenton adapts Miguel de Cervantes’ iconic novel for the stage, in a profound, lyrical and overall gut-busting adaptation of a classic tale. Set in a world of rogues, merchants, shepherds and galley-slaves, Don Quixote has been reading books about chivalrous knights who constantly save the day. Armed with a lance and a sword, he sets out to defend the helpless and confront the wicked, accompanied by his faithful, but ill-suited, companion. As they continue their riotous journey, it quickly becomes clear that both are losing their grip on reality! 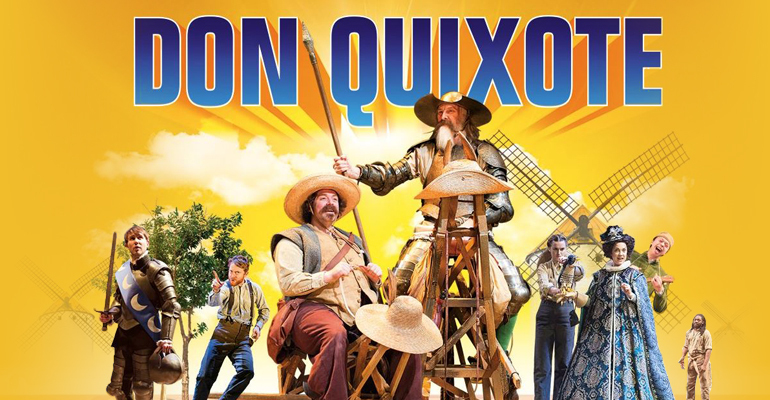 A madcap adventure filled with hilarity, David Threlfall stars as Don Quixote, alongside Rufus Hound as Sancho Panza. The production plays a strictly limited season at London’s Garrick Theatre, booking until 2 February 2019.